This type of exercise of review and analysis for one component (carbon) of a relatively simple forest type is more generally useful in focusing thought and perhaps field research; critical knowledge gaps identified for pines presumably also apply to more complex forest ecosystems. This volume also serves to illustrate the value of comparative field studies, which in this case were totally unplanned and retrospective. 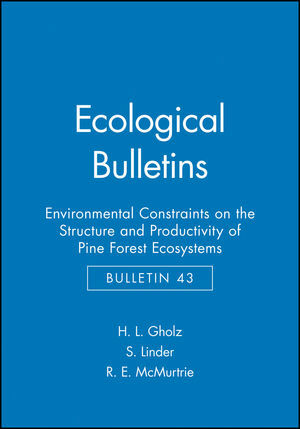 H. L. Gholz and S. Linder are the authors of Ecological Bulletins, Bulletin 43, Environmental Constraints on the Structure and Productivity of Pine Forest Ecosystems, published by Wiley. Contrasting patterns in pine forest ecosystems. Crown structure, light interception and productivity of pine trees and stands. Photosynthesis and carbon gain by pines. Environmental influences on the phenology of pine. The growth and function of pine roots. Environmental influences on carbon allocation of pines. Factors influencing the amount and distribution of leaf area of pine stands. Production and carbon allocation patterns of pine forests. Foliage and fine root longevity of pines. Evaluating potential response mechanisms of a forest stand to fertilization and night temperature: a case study using Pinus elliottii. Modelling the soil carbon cycle of pine ecosystems. Climatic factors controlling productivity of pine stands: a model-based analysis.